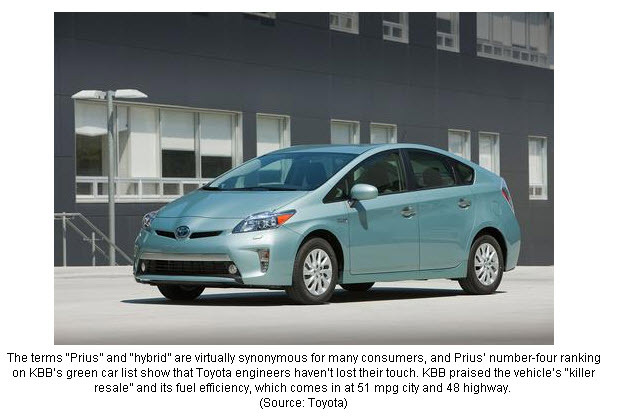 Kelley Blue Book (KBB) recently examined the world of high-efficiency cars the same way a tight-fisted consumer might. 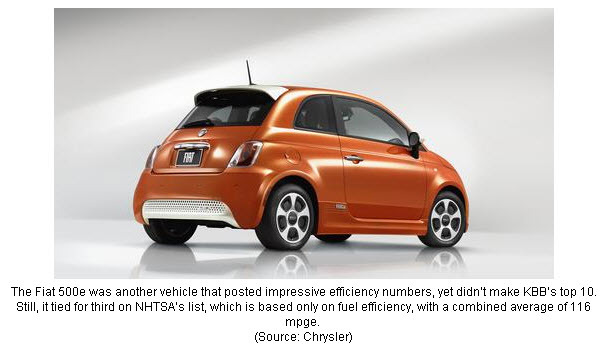 That might be why five of the National Highway Traffic Safety Administration’s ten (10) most fuel-efficient cars didn’t even make the list. 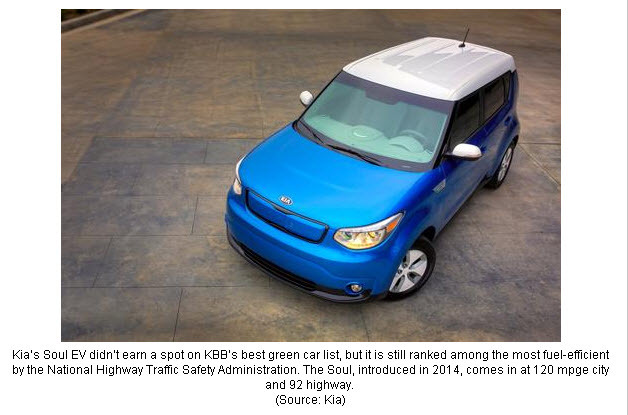 I have collected photos of KBB’s best, along with a few extra shots of high-mileage vehicles that didn’t make the cut. 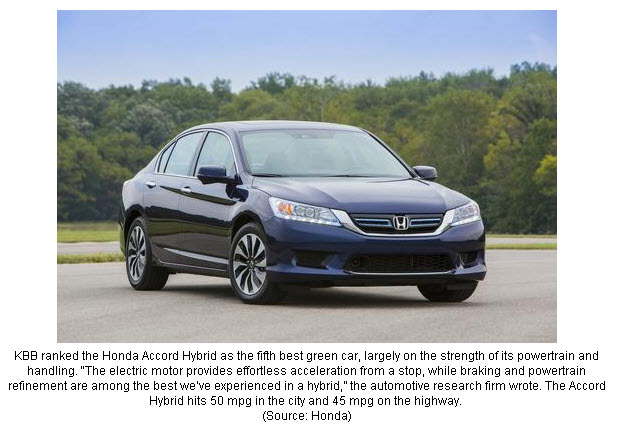 From pure electrics to hybrids to turbo diesels, the following is a look at the best and greenest cars on the road today. Before we take a look, let’s gage our post by looking at a very brief history of KBB. In 1918, a young man named Les Kelley parked three Model T Fords in an open lot, put $450 in the till and started the Kelley Kar Company. 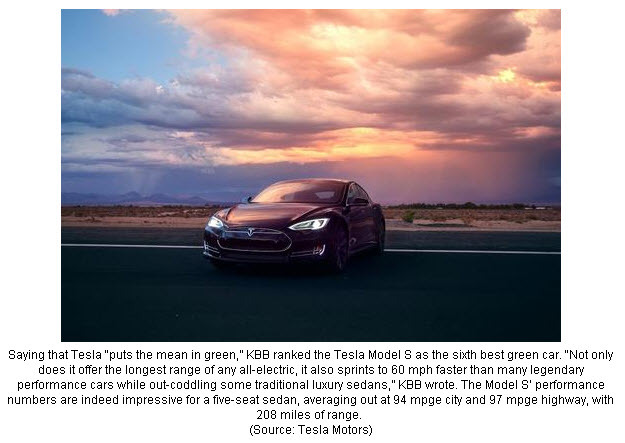 It was to become the largest dealership in the world and, along the way, spawn a need for placing values on used and even new cars, known as Blue Book® values. 1914 was an interesting year. A 19-year-old named Babe Ruth pitched his first game in the majors as a Baltimore Oriole. And Les Kelley, the son of a preacher from Arkansas, made his way to California at the age of 17. Les had no money and no job, but he owned an old car. It was in fine shape because he had a knack for mechanics and had overhauled it himself. All of his friends admired his car and frequently tried to buy it. After much persuasion he finally did sell it to one of them. With the money he received from this deal Les bought another old Ford. After giving this car a thorough overhauling, he traded it off, taking in two used cars and a little money on the deal. He reconditioned these cars and sold them. With the money he bought other used automobiles and found himself making enough money to pay his way through college. 1918 was an interesting year. Babe Ruth was now a pitcher for the Boston Red Sox, as they defeated the Chicago Cubs in the World Series. World War I ended on the 11th hour of the 11th day of the 11th month. And like many young men at the end of the war, Les Kelley sought to establish himself in the business world. He leased part of a lot from another car dealer in Los Angeles and started the Kelley Kar Company with three cars for sale. His brother, Buster, at age 13, joined Les as a lot boy, changing tires and washing cars. 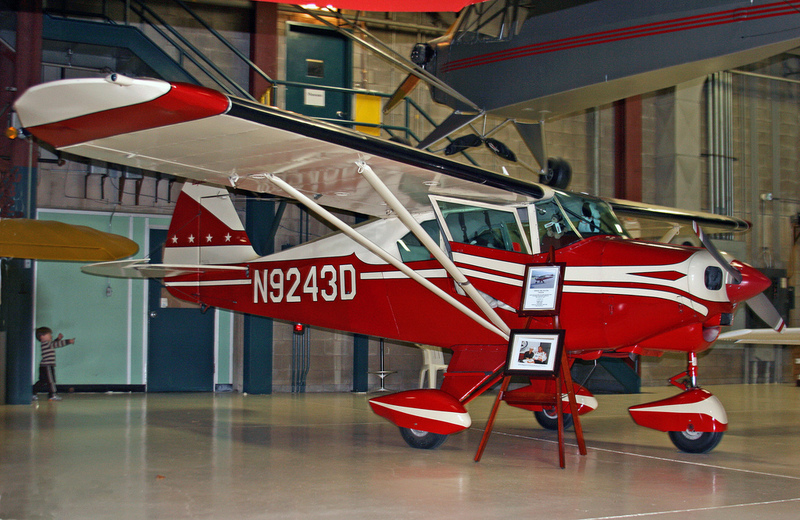 By the age of 18 Buster ran the repair shop with a dozen mechanics, and Les managed sales. Les and Buster did so well that they had to move to progressively larger sites. In the early 1920s, to help acquire new inventory, Les Kelley distributed to other dealers and to banks a list of automobiles he wished to buy and the prices he was willing to pay for them. The automotive community began to trust his judgment so much as an accurate reflection of current values, they started to request the list for their own use. When someone asked a dealer what his used car might be worth, the dealer usually took a look at Mr. Kelley’s list, conveniently tucked under his desk blotter. It didn’t take long for Les Kelley to realize that he could provide an ongoing service to dealers and bankers alike. 1926 was an interesting year for individual achievement. A 19-year-old American named Gertrude Ederle swam the English Channel. “Our Trudy” was the first woman to conquer the Channel, and her time was almost two hours faster than the men’s record. Babe Ruth led the Yankees into the World Series (although he made the final out in game seven, when he was caught stealing). Edsel Ford had risen to President of Ford Motor Company, soon to announce the Model A. And in Los Angeles, Les Kelley decided to expand the list of automobile values he had been producing since 1918 and published the first Blue Book of Motor Car Values . He showed factory list price and cash value on thousands of vehicles, from Cadillacs to Duesenbergs, from Pierce-Arrows to Hupmobiles. A 1926 Packard sedan limousine with balloon tires might fetch as much as $3,825. But a 1921 Nash touring car, even with a clock, was only worth $50. Les named the publication Blue Book after the Social Register, because it meant that you would find valuable information inside. (Emily Post had also just published her first book of etiquette, which was to later be named Etiquette: The Blue Book of Social Usage ). 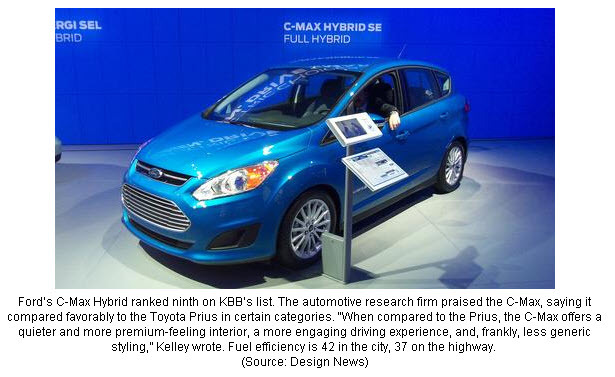 And Les Kelley was to make Kelley Blue Book synonymous with the authoritative source for car values. To this day, across the country, people ask the question, “What’s the Blue Book value of my car?” At the dealership Les was selling “Selected Blue Seal Automobiles,” so he carried the blue and gold ribbon medallion onto the cover of the Blue Book, where it remains today. By the late 1950s Les Kelley, then in his sixties, decided to cash in on some of that success. He made a decision to sell the dealerships rather than move them again (this time would have meant a move from downtown L.A., the current site of the Staples Center). By 1962 the Kelleys were completely out of the car business and devoting full time to the Blue Book , with Buster as Publisher and Bob (shown here) as Assistant Publisher. The company moved to Long Beach and later to Orange County. Les continued to be active in the business until his death in 1990, at the age of 93. For the next 30 years the Blue Book was to thrive as a “trade” publication, meaning it was only sold to businesses involved in the automotive industry, such as car dealers, financial institutions and insurance companies. These customers used the bimonthly book to determine everything from loan values to suggested retail prices. 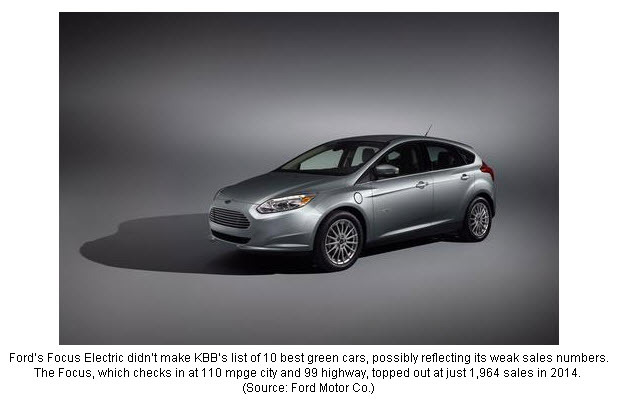 Kelley Blue Book continued to innovate, becoming the first publication to show the effect of high or low mileage on a car’s value. As a natural evolution, the company began publishing other value guides. A New Car Price Manual was added in 1966, and the company became the industry’s leading provider of pricing services. Auto dealers sometimes carried recreational vehicles or took them as trade-ins, so they needed information on these too. Kelley Blue Book developed RV guides that place values on everything from travel trailers to campers to ATVs to snowmobiles. A separate Motorcycle Guide was published, and a Manufactured Housing Guide. As the quality of cars improved, people began to drive them longer. The average age of a vehicle on the road today has been estimated to be about nine years. The Blue Book covered seven years, so it made sense to produce a sister publication, the Older Car Guide , that provided values another 14 years back. Then came the Early Model Guide , which today provides values all the way back to 1946! In 1993 Kelley Blue Book made its initial venture into the consumer marketplace by publishing a Consumer Edition of the Blue Book . It quickly became the nation’s number-one-selling automotive book, often making the USA Today best-seller list. 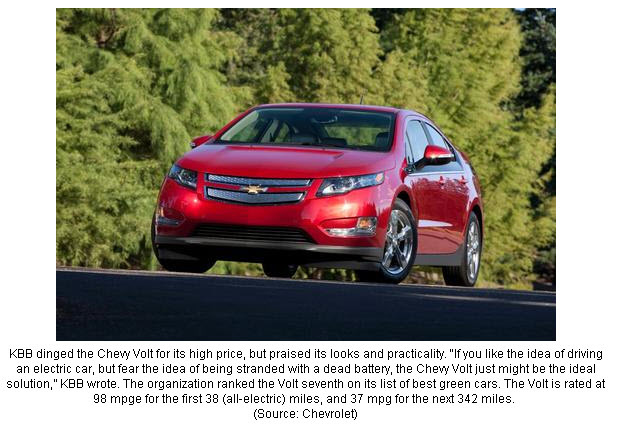 It features 15 years of used car values on more than 10,000 models of cars, trucks and vans and is available in bookstores, auto supply stores and other locations. Quietly though, something called the World Wide Web was introducing regular people to a medium called the Internet. 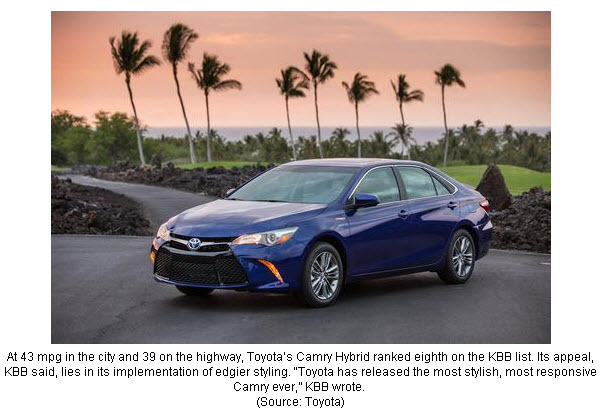 It was innovation time again, and Kelley Blue Book saw a further opportunity to facilitate transactions between consumers and retailers. The company created a Web site, kbb.com, running on a single PC and offering first, new car prices in 1995 and then its famous used car values in 1996. Early in 1996, 20,000 people a month found their way to the site, largely by word-of-mouth. 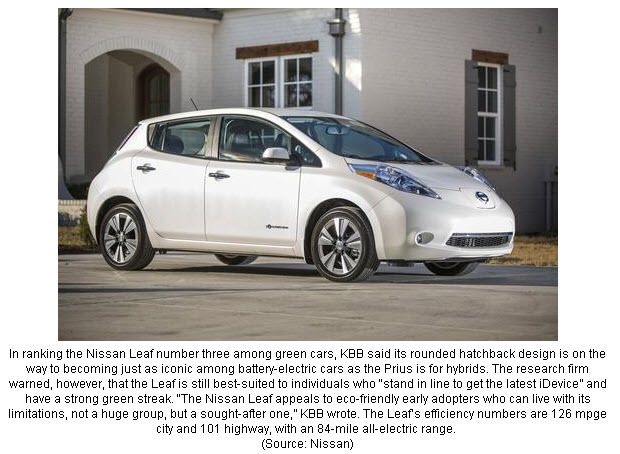 That number has grown a bit since then and now exceeds seven million visitors a month coming to kbb.com and millions more viewing Blue Book information on numerous portals and other automotive sites, including those of auto manufacturers and car dealers. So much for history. 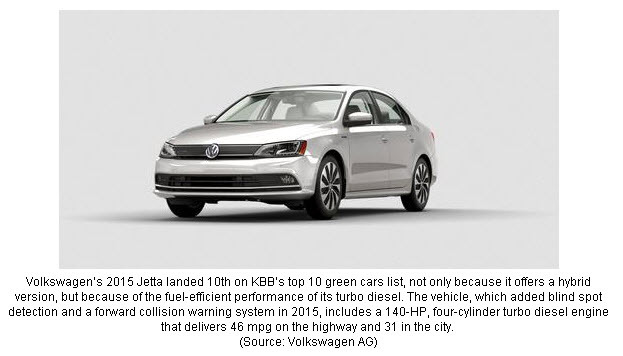 Let’s now take a look at what KBB considers fifteen of the “greenest” automobiles in the lineup today. Here we go. 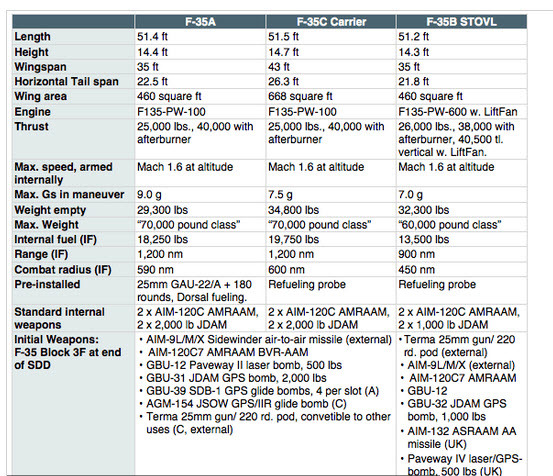 Please note, the automobiles given above, for the most part, look at mileage only. Not reliability or cost of ownership. Those numbers represent a post for another day. Hope you enjoy this one. Data for this post was taken from the following sources: 1.) Design News Daily, and 2.) Those references given on the individual slides. 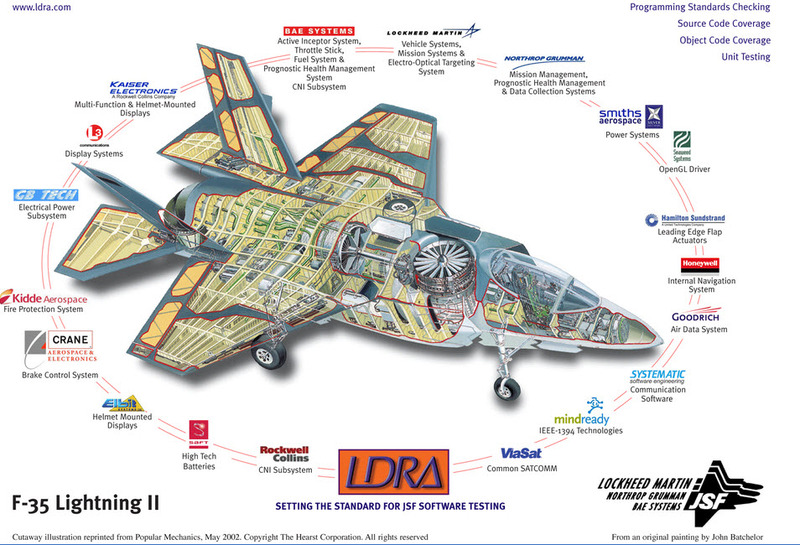 There are others depending upon the branch of engineering in question. 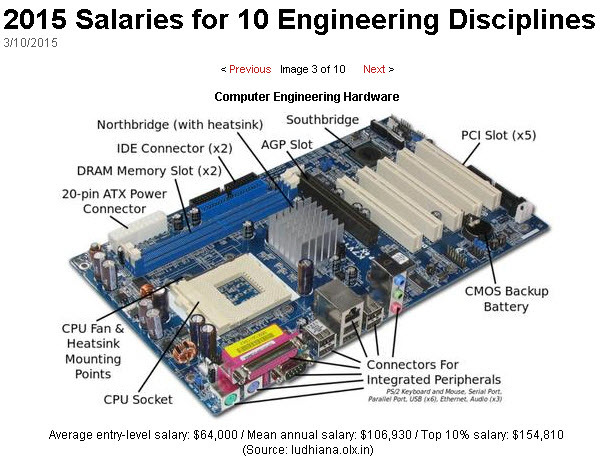 There are also a large number of computer programs specifically written for each engineering discipline. 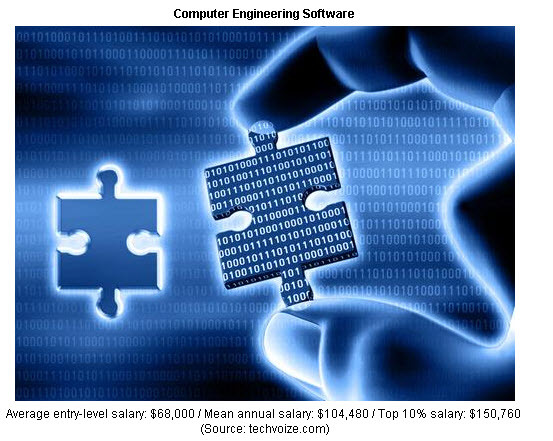 With that being the case, what would you say are the highest paying engineering salary levels by discipline? You might be surprised. I was. The following slides basically speak for themselves and represent entry level, mid-level and high-paying salaries for graduate engineers. Let’s take a look at the top ten (10). 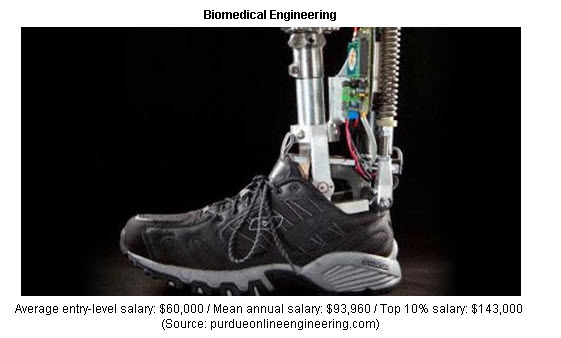 I’m not surprised at biomedical engineering being in the top ten. 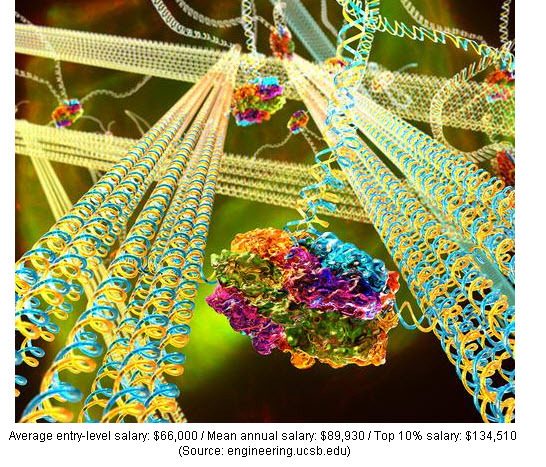 There is a huge demand for “bio-engineers” due to rapid advances in technology and significant needs relative to non-invasive medical investigations. 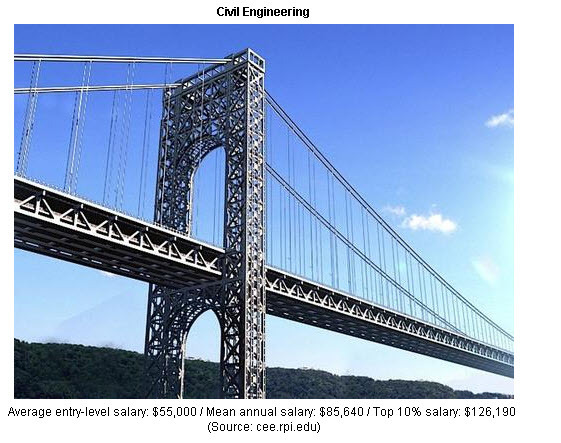 The next one, Civil Engineering, does surprise me a little although we live with a crumbling infrastructure. Much more needs to be accomplished to redesign, replace and upgrade our roads, dams, bridges, levees, etc etc. We are literally falling apart. The next two should not surprise anyone. IT is driving innovation in our time and the need for computer programmers, hardware engineers and software engineers will only increase as time goes by. 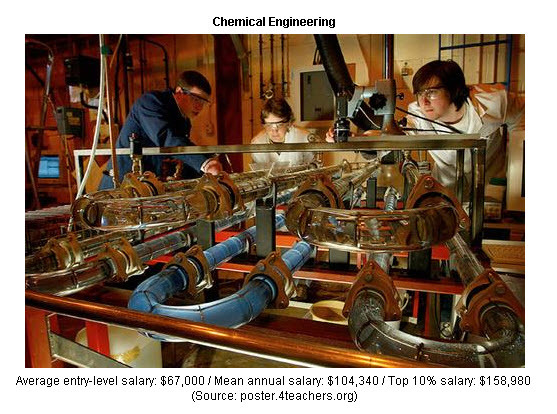 Chemical engineering has always been one of the top engineering disciplines. CEs can apply their “trade” to an extremely large number of endeavors. 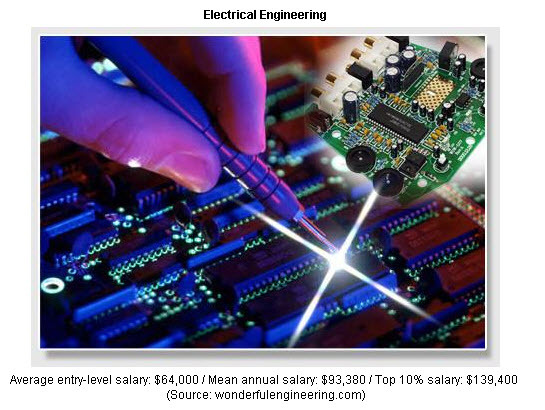 During my time EEs were the highest paying jobs. They still are. 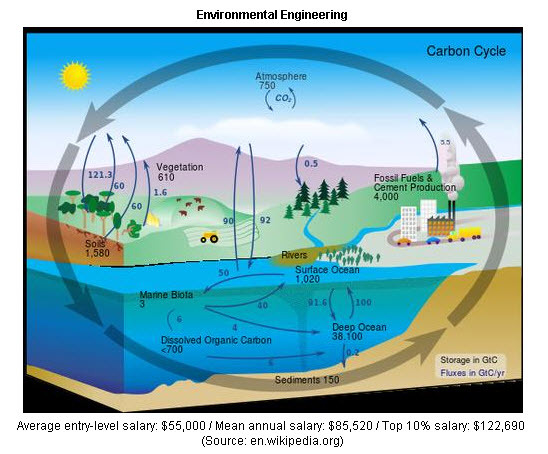 Years ago, environmental engineering was included in the CE discipline. Today, it is important enough to stand alone and provide excellent salary levels. 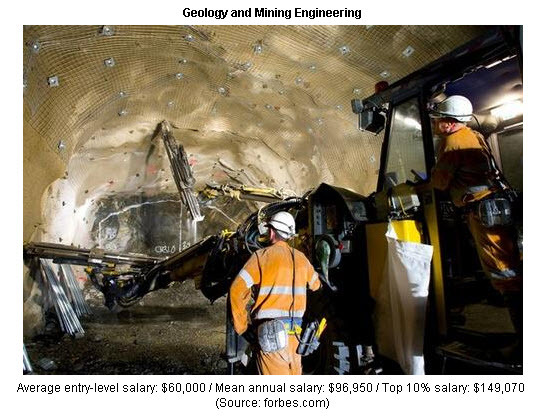 Geology and Mining engineering has taken off in recent years due to needs brought about by the oil industry. More than ever, new sources of natural gas and oil are needed. The term fracking was unknown ten and certainly twenty years ago. Material Science is one of the most fascinating areas of investigation undertaken in today’s engineering world. 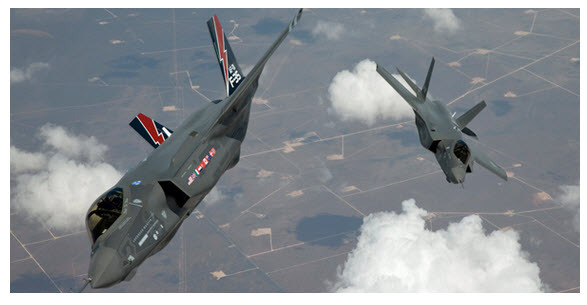 Composite structures, “additive” manufacturing, adhesives, and a host of other areas of materials engineering are producing needs throughout the profession. I am a mechanical engineer and greatly enjoy the work I do in designing work cells to automate manufacturing and assembly processes. The field is absolutely wide open. I hope you enjoy this very brief look at the top ten disciplines. I also hope you will be encouraged to show this post to you children and grandchildren. 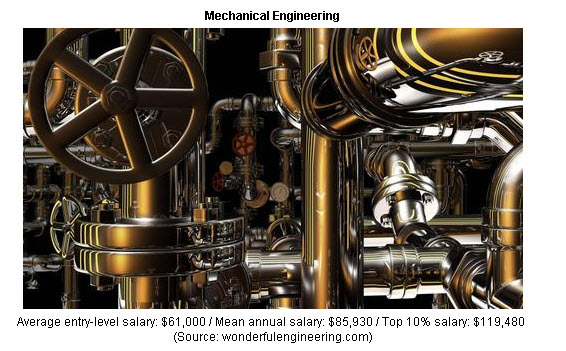 Explain what engineers do and how our profession benefits mankind. Compressed Natural Gas or CNG is finding its way into a variety of applications, both commercial and residential. Our country is looking for alternatives to petroleum-based products for transportation and CNG is one method to accomplish this desired outcome. Global CNG demand was 61,668 MCM in 2013 and is expected to reach 108,957.9 MCM by 2020, growing at a CAGR of 8.5% from 2014 to 2020. Light duty vehicles (LDV) were the largest CNG consuming segment and accounted for 48.3% of total market volume in 2013. Growth of passenger cars particularly in emerging markets of BRICS is expected to drive this segment. LDV is also expected to witness highest growth rate over the forecast period. 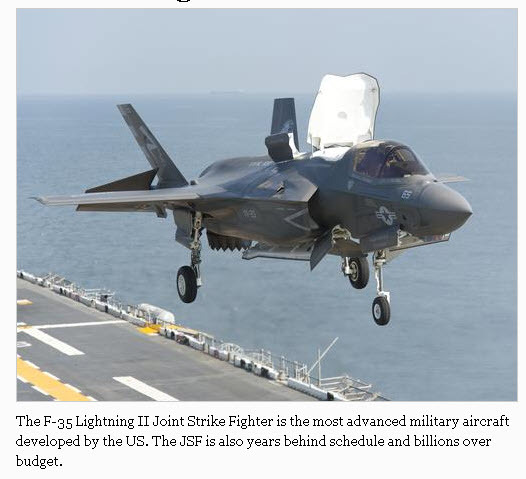 The segment is expected to grow at an estimated CAGR of 9.1% from 2014 to 2020. Asia Pacific was the leading regional CNG market and is expected to continue its dominance over the next six years in the global market. The region accounted for 46.6% of total market volume in 2013. 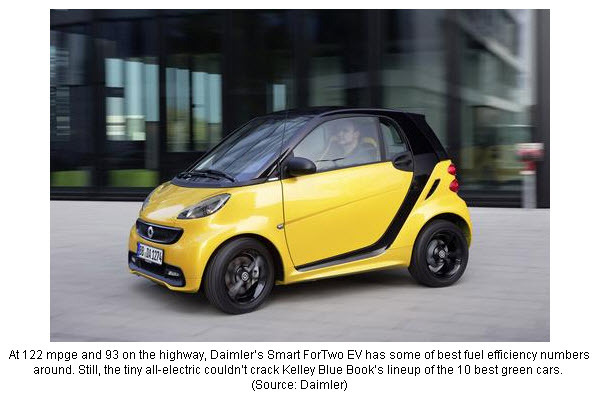 Positive outlook on automotive industry coupled with government support to promote the use of alternative transportation fuel particularly in China and India is expected to drive the regional CNG market. Central & South America is expected to be the fastest growing regional market for CNG at an estimated CAGR of 17% from 2014 to 2020. Highly fragmented CNG industry participants compete on the basis of price differentiation across various regions. Major industry participants operating in the global CNG market include National Iranian Gas Comp, Indraprastha Gas Ltd (IGL), China Natural Gas Inc and Mahanagar gas Ltd (MNGL). In the United States, the CNG market has grown at a rate of 3.7% since the year 2000. The market for these products has seen slow growth to this point for the following reasons: 1.) Availability of the products, 2.) Heat build-up during the compression process, 3.) Time delays in the refilling process and 4.) The expense of locating CNG at the market locations. The areas of greatest growth in the CNG market are in the area of transporters that possess fleets (Tractor Trailers), Straight Trucks, and Public Transportation such as school and/or city buses. California and Texas lead the way with CNG fueling stations on a national level. There are approximately 1,300 CNG fueling stations in the US today; however, 730 are public stations with the remainder being private fleet stations. To give you an idea as to the need, there are currently fewer than ten (10) public CNG filling stations within the Tri-State area of Tennessee, Georgia, and Alabama. Southeast Tennessee currently has no CNG fueling stations. The industry is rapidly changing as the 2014 EPA NHTSA Heavy Duty Truck Program has been put in place by President Obama. This legislation has forced fleet and fuel managers to reduce emissions as well as increase fuel efficiency. Small savings have been made by reducing drag, adequate tire pressure, and reduced idling practices. CNG is a “game changing” modification that addresses the new standards that are currently in place as well as future reductions that are scheduled for 2018. The proper approach is to adopt a customer centric approach that addresses the needs of the immediate market based on available original equipment and after market manufacturers. Some industry pundits have estimated CNG will realize 25% annual growth for the next five (5) to ten (10) years on a conservative level. Key points in defining the market segment for CNG are existing markets and projected future markets. Electric power and industrial markets make up almost 60% of the current consumer market. Existing markets include the fields of Agriculture, Industrial, and Motor Fuel in a static environment. Projected markets include opportunities in a more mobile environment. Transportation appears to be the most likely segment to grow as it makes up less than one percent (1%) of total natural gas used. Currently, the market is distributed with limited, if any, diversity of participants. Trending for share gains and losses typically represents large potential for gains across the entire industry. Share losses are predominantly absorbed by the diesel fuel and propane distributors, as recent supply shortages have clearly proven in the motor fuel and poultry industries. Market share will be lost by the above mentioned industries due to loss of confidence by the respective customer bases. The current and projected trends in the motor fuel industry are now driven by the Tier II Fuel Initiative causing off road diesel fuel to be banned in the near future. The result of the ban will continue to be increases in motor fuel pricing. As motor fuel costs increase, CNG becomes not only the clean alternative fuel replacement, but also the affordable alternative. CNG cuts the cost of a diesel equivalent gallon by as much as fifty percent (50%) based on the volatile and often fluctuating diesel market. Also, CNG is a much more effective fuel in cold weather areas as opposed to diesel and the multiple problems which exist. The implied trends in the propane and agricultural industries currently indicate an extended, long-term propane supply shortage. The result is that CNG becomes the efficient, clean energy solution by cutting propane costs by twenty-five (25) to fifty percent (50%). Users of CNG are looking for quality and productivity improvements. The history of CNG development has resulted in the need for creative technology solutions that enable the full application of the CNG Natural Gas Industry. Recent patenting and innovation that Cielo has identified allows CAF to operate more efficiently than diesel or propane. 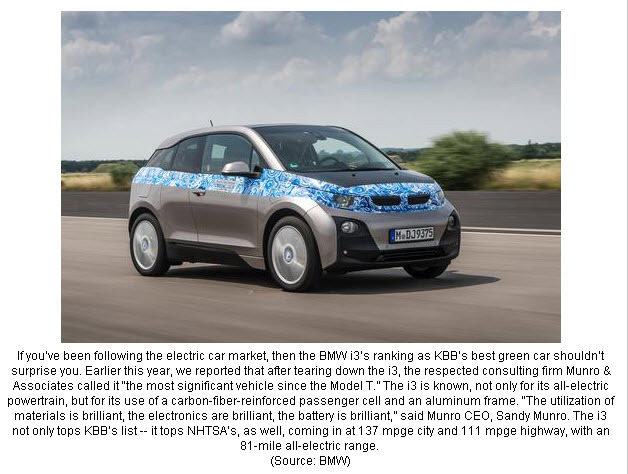 The stability of this market segment is solid, based on CNG product category performance over the past two years. The forecasters predict an exponential growth over the next two years. Agricultural, with customer applications being in the fields of poultry farming, grain drying, irrigation, hydroponics and propane displacement for remote locations with no historical access to natural gas. Industrial, with customer applications in the fields of electric generators, heat production, lumber drying, and forklift fuel. Motor Fuel, involving Duel Fuel Fleets and Designated Gasoline Fuel Fleets. The Motor Fuel segment of the market is generally based on diesel with retail prices in the range of $3.50 to $4.00 per gallon. 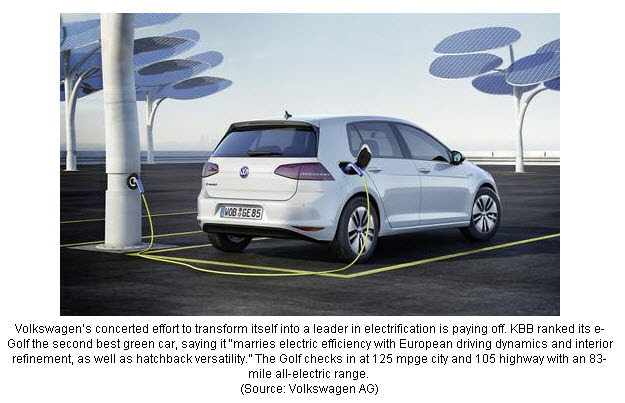 The vast majority of sales in this category will be handled by on site stations at fleet terminals or using the GTM model providing on demand fleet fueling. Transportation represents the largest sector of gas consumption and emissions in the US. The aforementioned legislation has forced fleet and fuel managers to prepare for potential penalties that could have dramatic balance sheet implications if found to not be compliant. 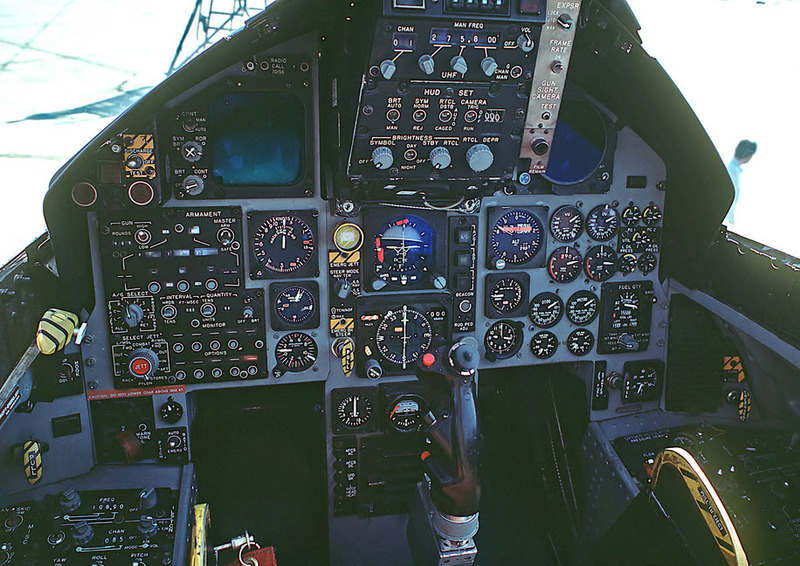 Over the past thirty (30) years, equipment manufacturing companies have proven that meaningful features can be developed for this class of fuel. 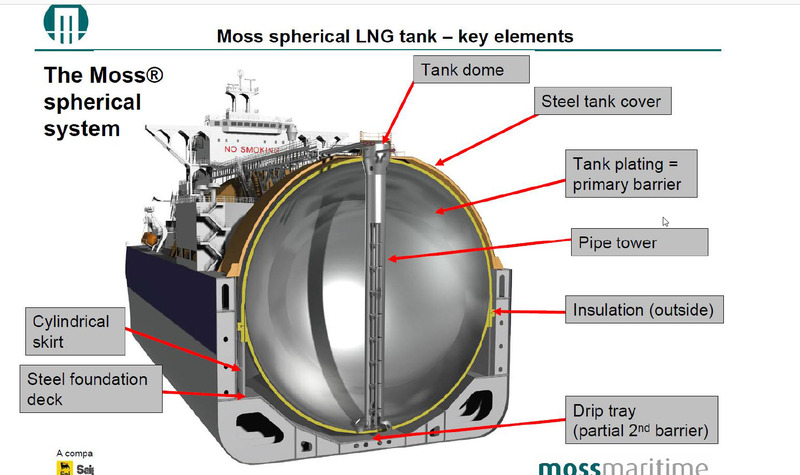 These companies have primarily focused on the use of pipelines to improve the quality of transport in Natural Gas. These products have been successfully distributed in many areas of the industry, in a limited capacity. 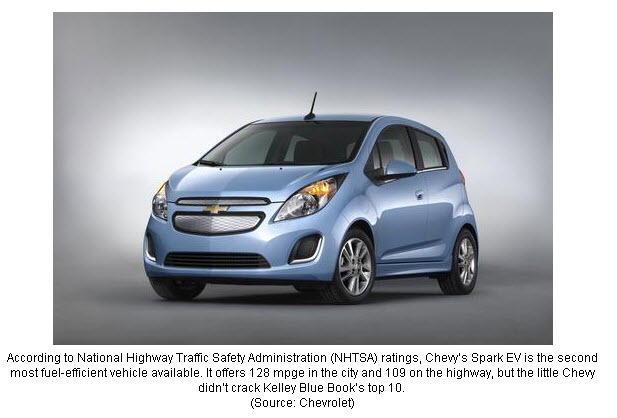 In the next 5 to 10 years it is estimated that there will be more than 18 million vehicles on US highways. The market potential for CNG in these quantities–with a current retail price of $2.50 per DGE (Diesel Gallon Equivalent)–is approximately $2.6 billion per month in revenue with an equivalent net profit of $45 million dollars. This translates to a market share of approximately two percent (2%) of the overall market. An excellent comparison is the country of Iran has 3,300,000 natural gas vehicles on the road today compared to United States with 250,000 to 300,000. In conclusion, CNG seems to be one very great possibility for commercial AND domestic transportation. Only time will tell. As always, I welcome your comments. Since 1986 I have done business with a small regional bank; checking account, savings account, etc. I chose that bank, as opposed to larger national banks, due to their size, efficiency and very friendly customer relations. Good choice on my part and I have been proved correct. Let me now relate to you a conversation I had two years ago with a lady named Wanda in bookkeeping. WANDA—Mr. Jackson have you been to Detroit lately? JACKSON—Its’ been a very long time but no, not within four or five years. WANDA—Well, your debit card has. There are sixteen (16) charges on your business account over the past two days. All from charges in the Detroit area. JACKSON—What on earth are the charges? WANDA—McDonalds twice, a pet store, two hotel bookings, a beauty salon, restaurants and there’s more. JACKSON—None of those charges are mine and I have no idea as to how they were made. WANDA—Have you lost your card? Did you leave it someplace? With this question being asked, I pulled out my wallet and took a look. The card was right there. JACKSON—Wanda, I have it right here. How could this have happened with me not having the card stolen or my losing it? WANDA—We fight these battles every day, Bob. Here’s what we need to do; let’s close the account right now so no more charges will be made. You need to get to the bank ASAP and sign sixteen documents stating you have not made the charges shown. Can you come in today? We can reimburse your account after establishing another. Since you have fraud protection you will not lose any money but it will take about two weeks. I left immediately for a visit to my bank and did just as she said—sign sixteen (16) individual documents stating the charges made to the establishments were fraudulent. It took the better part of an hour. I did receive reimbursement for the fraud; $ 612.58 to be exact. Let’s now take a look at the problem to see just how prevalent it is. AND IT IS HUGE !!! My card was stolen, I think, by an employee working in a Subway Sandwich Shop. He or she just lifted the necessary information from the card. 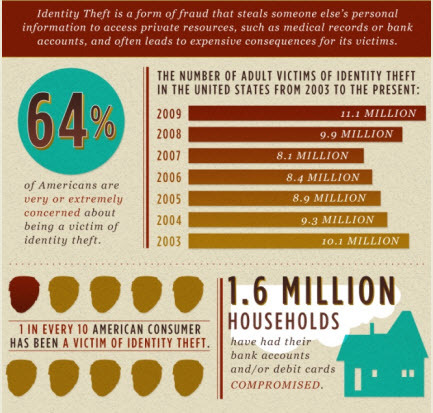 As you can see from the JPEG above, one in ten Amercian consumers has been a victim of identity theft. 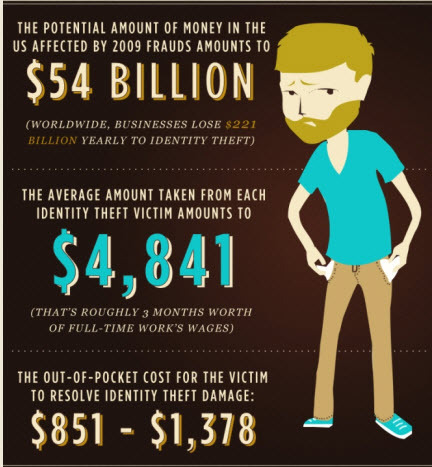 Over one and one-half million households have had their bank accounts compromised, and these are 2009 numbers. 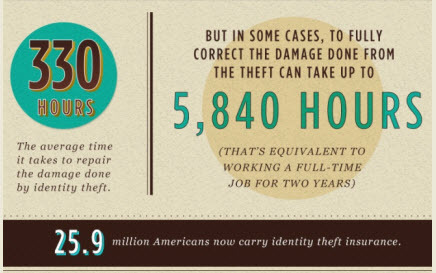 The amount of money stolen from me was approximately $600.00 which means I’m small potatoes to the $4,841 dollar average theft. In our country right now, that’s approximately three month’s worth of full-time work. Adding insult to injury; the out-of-pocket expense to right the situation is between $851 and $1,378. Our credit reporting agencies do a horrible job with individual accounts which leads to seventy percent of individuals experiencing fraud having real difficulties in removing the negative numbers from their accounts. As you can see, it takes an average time of 330 hours to repair the damage, done and to fully correct the damage requires 5,840 hours. If time is money—that’s money. 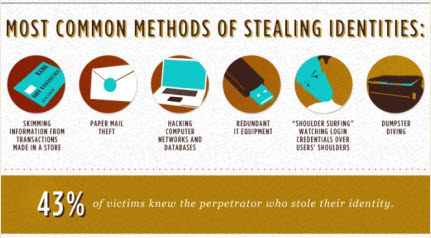 The following JPEGs will show the most common methods of stealing identities and how to protect yourself from the occurence. “Biometrics is the science and technology of measuring and analyzing biological data. It is used to uniquely identify individuals by their physical characteristics or personal behavior traits. It is used to allow employees access to certain areas and for general ID purposes. 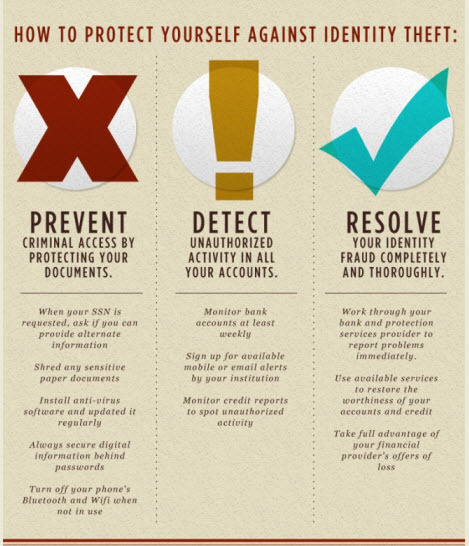 A biometrics system goes through three basic steps: 1. Acquiring data, 2. Encryption. 3. Analysis of data. Voice: the analysis of the tone, pitch, cadence and frequency of a person’s voice. Behavioral characteristics are related to the pattern of behavior of a person, including but not limited to rhythm, gait, and voice. Some researchers have coined the term behavior metrics to describe the latter class of biometrics. The magnetic strip used on all American credit and debit cards is antiquated technology that has served its’ purpose. As we have seen, it certainly is and can be compromised. The charts above indicate personal experience that drives this home. A magnetic strip card is a type of card capable of storing data by modifying the magnetism of tiny iron-based magnetic particles on a band of magnetic material on the card. The magnetic strip, sometimes called swipe card or magstripe, is read by swiping past a magnetic reading head. Magnetic stripe cards are commonly used in credit cards, identity cards, and transportation tickets. Magnetic recording on steel tape and wire was invented during World War II for recording audio. In the 1950s, magnetic recording of digital computer data on plastic tape coated with iron oxide was invented. In 1960 IBM used the magnetic tape idea to develop a reliable way of securing magnetic strips to plastic cards, under a contract with the US government for a security system. A number of International Organization for Standardization standards, ISO/IEC 7810, ISO/IEC 7811, ISO/IEC 7812, ISO/IEC 7813, ISO 8583, and ISO/IEC 4909, now define the physical properties of the card, including size, flexibility, location of the magstrip, magnetic characteristics, and data formats. They also provide the standards for financial cards, including the allocation of card number ranges to different card issuing institutions. What if, there was a biometric access point on each credit and debit card we owned? Every time you made a purchase with a card, you had to use biometrics to complete the transaction. The metric was a singular part of the card with equipment owned and operated by the vendor or merchant to receive the biometric data supplied by each individual. What if, we do away with passwords and PINs and replace those with biometric information relative to the individual user. Specific physiological information unique to the user and more importantly the owner of the equipment itself. Cards, credit and debit, PCs, smart phones, i-pads, tablets, etc—what if. In my opinion purchase power and digital equipment are headed in this direction. We know that financial establishments in the European Union are embedding “chips” into credit cards for lessen fraud. 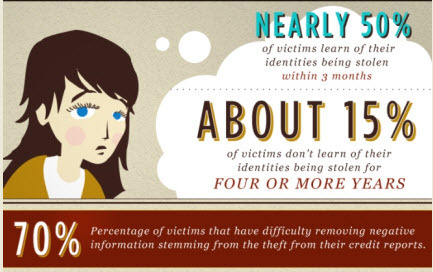 Biometrics is much safer and will provide greater security in the long run. I think we are headed in that direction.